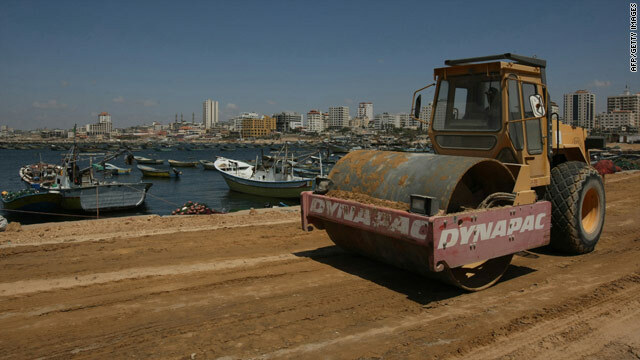 Palestinian workers prepare Gaza City's port to receive ships expected to break Israel's naval blockade. (CNN) -- Defying Israel's controversial blockade, a flotilla of pro-Palestinian activists are vowing to come face-to-face with Israeli forces to deliver supplies to Gaza, a Free Gaza Movement organizer said. Convoys have left European ports in a consolidated protest organized by two pro-Palestinian groups to deliver tons of food and other aid to the Ashod port in Israel, where it will be unloaded and transferred to Gaza, the organizer said. The maritime convoys are being organized by both the Free Gaza Movement and the Turkish-based IHH, a humanitarian relief foundation affiliated with the Muslim Brotherhood religious group. "We are doing nothing but humanitarian aid, we are helping 1.8 million Palestinians trapped in the Gaza Strip starved to death," said Osama Qashoo, an activist aboard one of the vessels. "We have no choice but to bust through." In the meantime, Stand With Us, a pro-Israel advocacy group, has organized a six-boat flotilla as a counter-demonstration against the Turkish flotilla. Michael Dixon, a member of the pro-Israeli group, says the real aim of the Turkish group is not humanitarian, but to draw attention to itself. "We are here today to protest the hypocrisy of the boats coming in towards Gaza right now. They profess to be human rights activists, but they don't say anything about the suffering of the Palestinians under the brutal Hamas regime," Dixon said. "The people on the boat refused a letter to Gilad Shalit, an Israeli soldier who has been kept captive in isolation for three years. That shows you the type of people we are dealing with," he said.